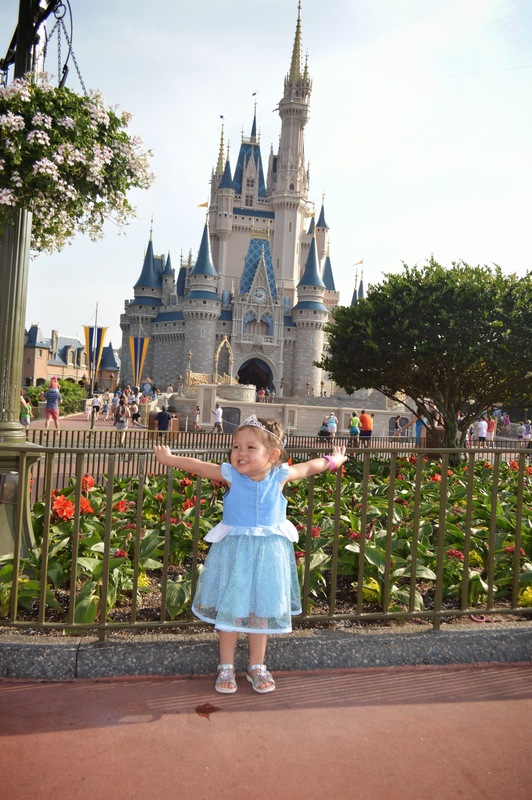 We have had a very magical experience at Disney so far! 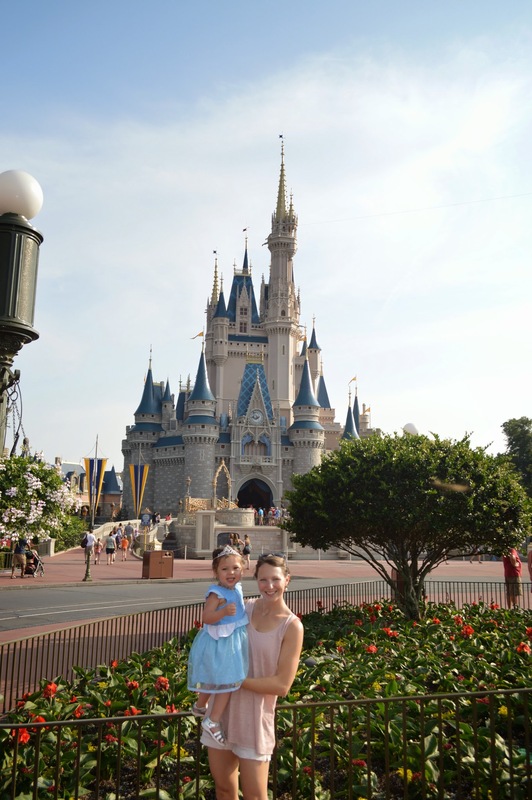 Day 1 (Saturday) was our arrival day. We spent the afternoon and evening exploring our hotel, taking advantage of the large pool and eating an African themed dinner. 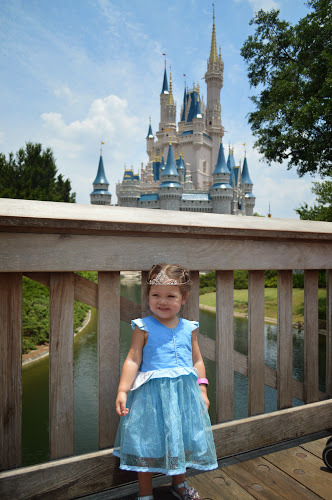 Yesterday (Sunday) was our first full day at the parks. 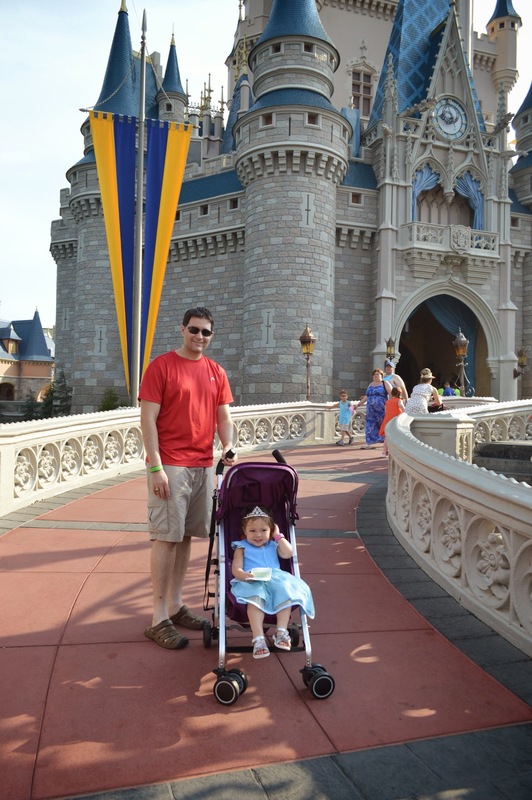 We started in Magic Kingdom and arrived before the gates were open. We were excited to be able to watch the train pull into the park carrying all of the characters and some of the princesses. Because we arrived early we were able to take our time admiring Cinderella's castle on our walk in and even get quite a few photos with only a few people in the background! 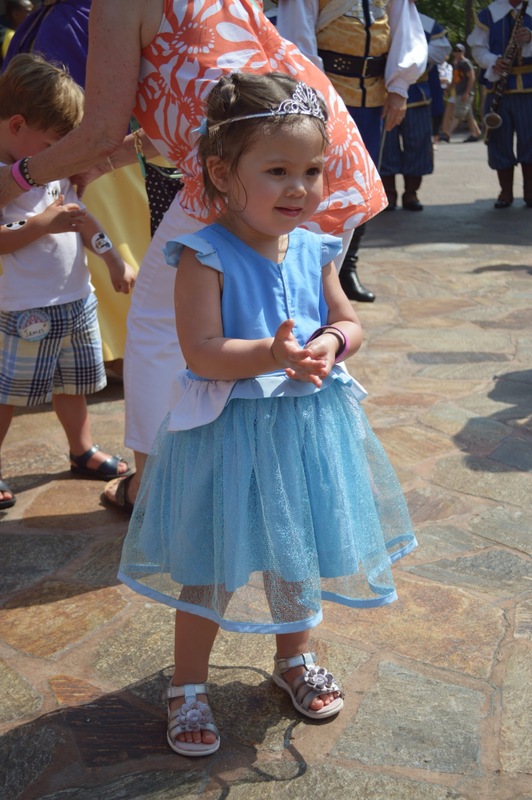 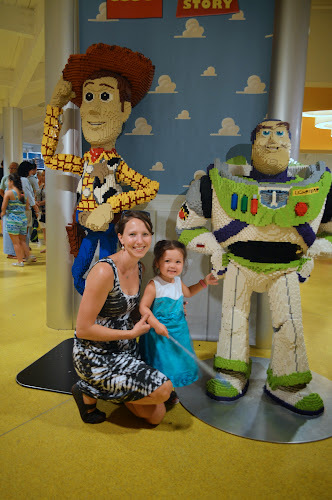 Eliana wore her 100% Cotton Cinderella Dress that I made her in anticipation of the heat. Despite the high of 96 degrees (unseasonably high for this time of the year) she was comfortable (well as comfortable as you can bei n 96 degrees). 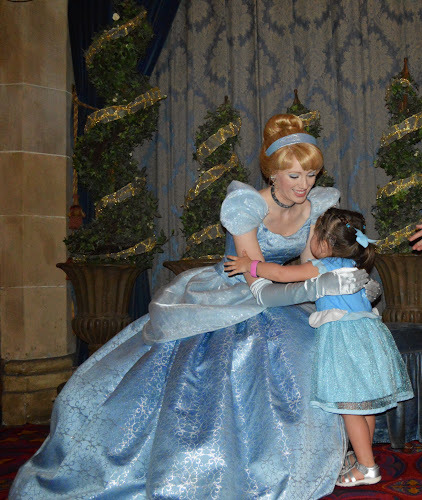 Our first scheduled event for the day was Breakfast With The Princesses at Cinderella's Castle. 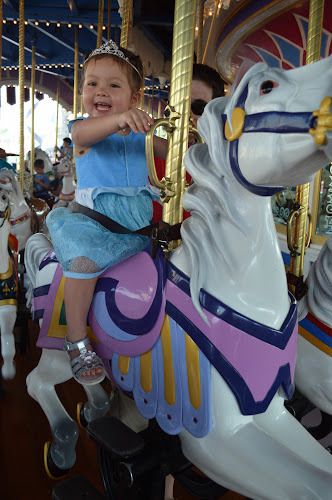 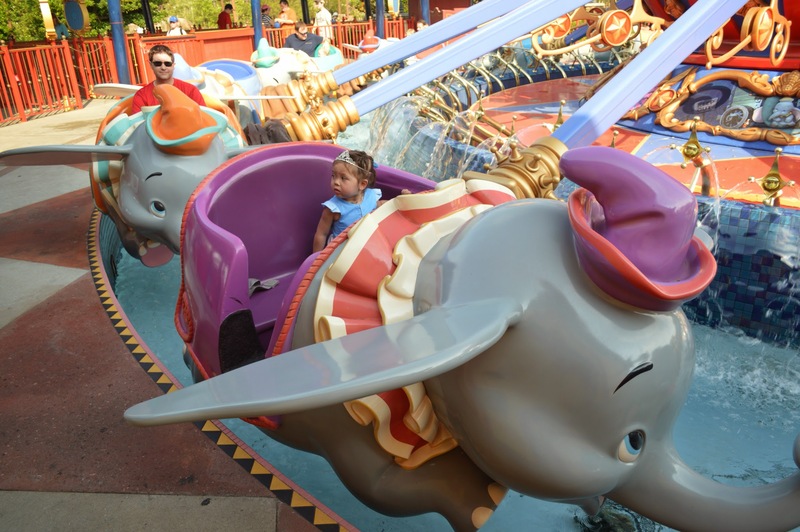 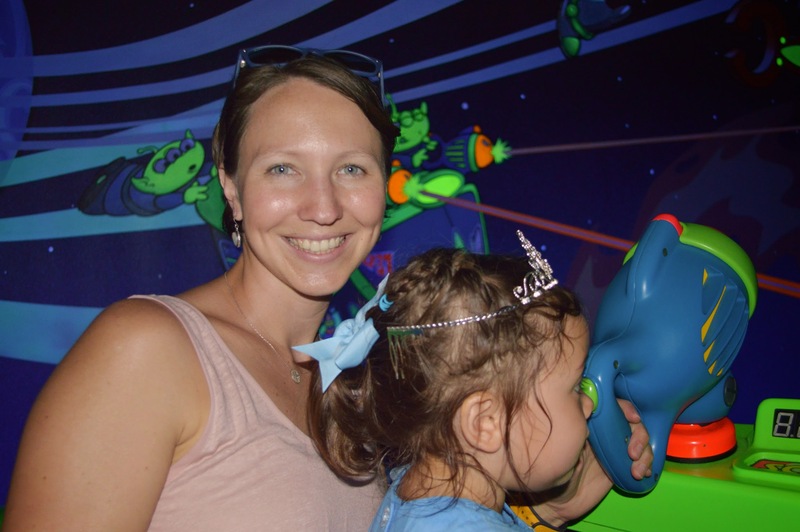 Since we arrived early we were able to get a ride on the Carasoul, the Flying Dumbo Ride and explore Fantasyland prior to entering the castle. 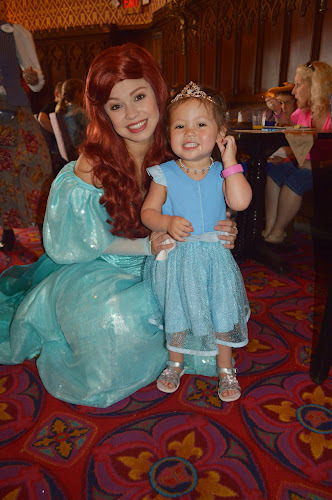 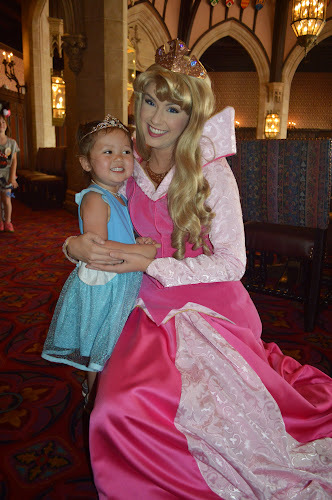 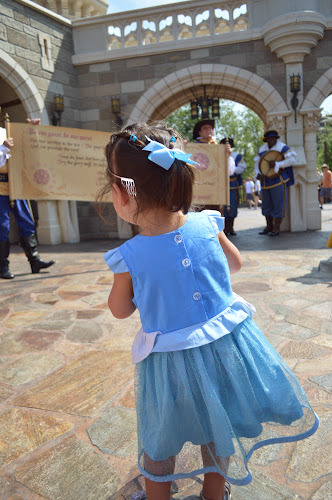 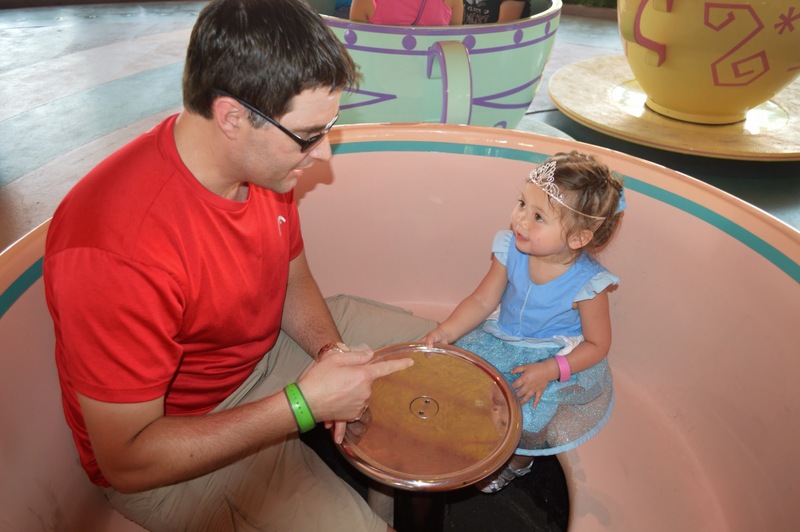 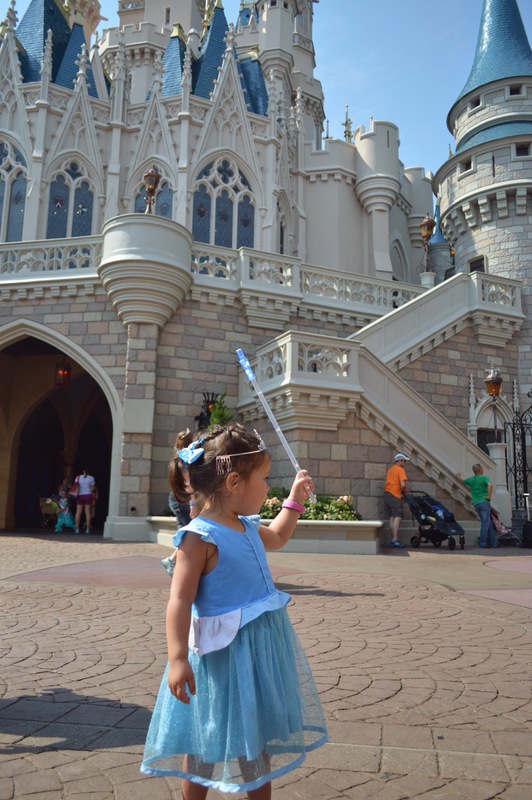 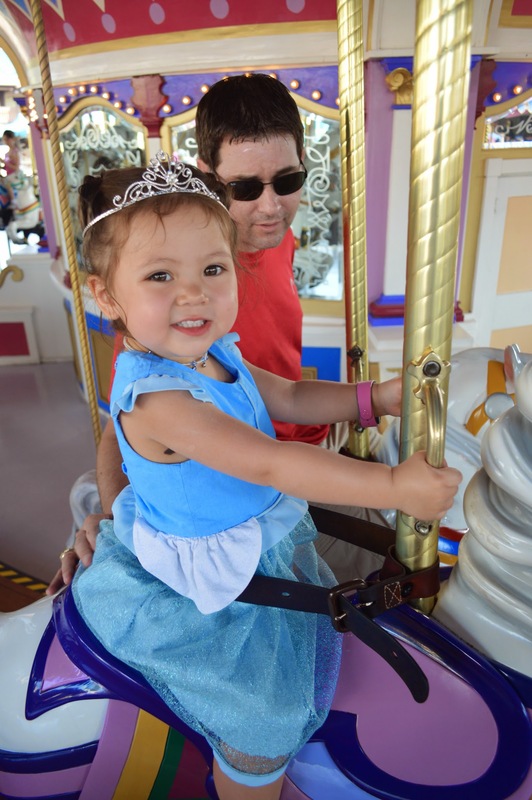 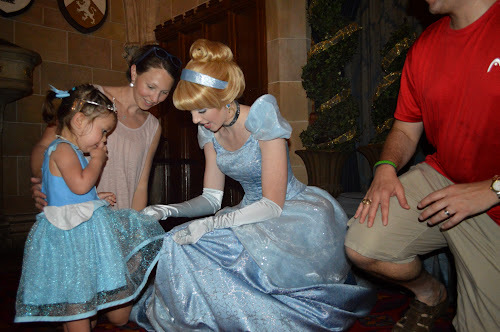 Once we did enter the castle, Cinderella was eager to spend time with us as Eliana danced and twirled with her, talked to her about their matching dresses and "slippers" (shoes) and admired each other's jewelry (necklaces and tiaras). 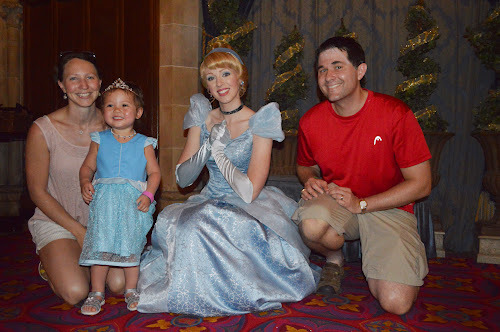 We were the only people in the "meet Cinderella area" (I think this just happened luckily because on our way out there was a line of people waiting to meet her) which allowed us lots of time to acquaint ourselves with the REAL Cinderella! (This Post Is Being Uploaded Via an iPad While On Vacation. 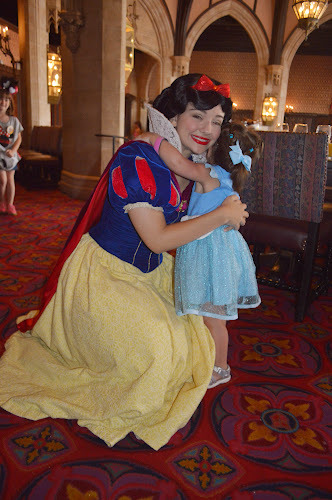 Please Excuse Poor Quality and Misplacement of Photos. 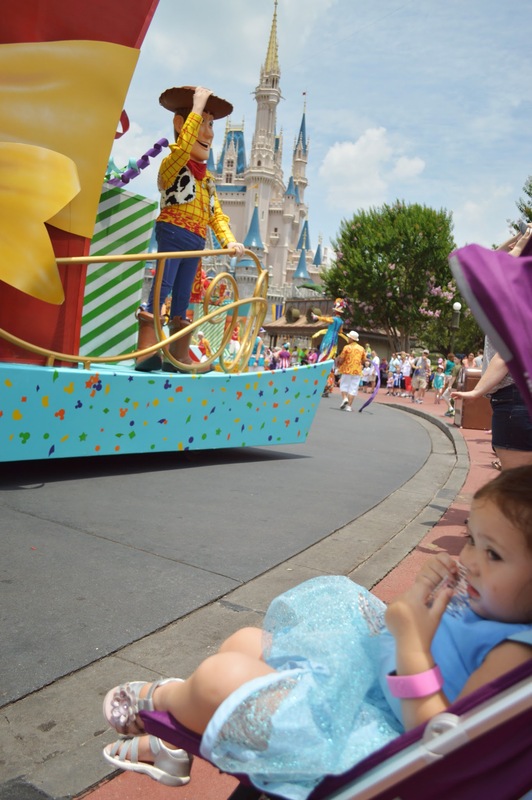 A Complete Review of The Vacation Will Be Posted Shortly After Returning Home).